Want to appear on Mark Cuban's AXS-TV? Are you ready to CountryUP? Some of our favorite music is that which crosses boundaries and defies traditional classification. The CountryUP challenge is about finding the artists who best represent the spirit of country music. Whether it's The Beatles doing Carl Perkins, or B.o.B. 's “Both of Us” with Taylor Swift, the melding of influences can be a beautiful thing. So are you steeped in Americana? Let's hear it – time to CountryUP! Rock, Pop, Urban, and of course Country artists are all welcome to submit. 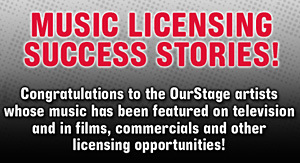 Enter your track into the OurStage CountryUP channel between March 18 and May 21, 2014. Then rally your fans to judge for you in the channel – if you make it to the Top 40 by May 30, you are eligible to be one of the three artists selected to appear on the AXS-TV country show, where you'll be interviewed and act as co-host. You may also be eligible for future rounds of competition and prizing. Judging starts on March 20th at noon ET. The winners will be selected on or about June 16, 2014. Participants must be eighteen (18) years of age or older at time of entry and must reside within the contiguous United States.